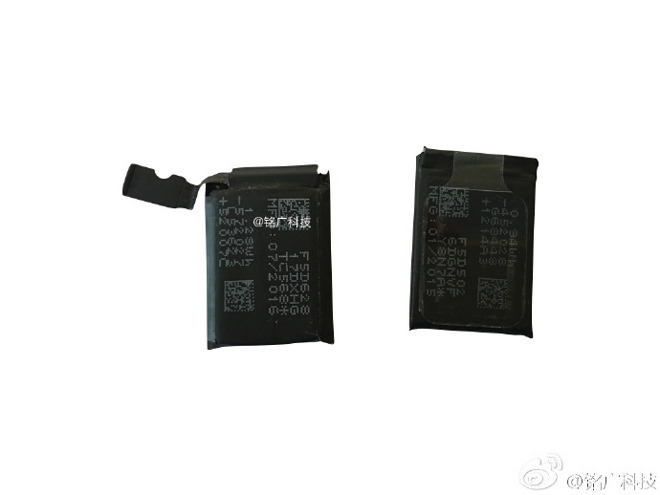 A photo uploaded on Sunday purportedly shows a 334 milliamp-hour battery destined for the second-generation Apple Watch, which would represent a small but significant improvement over the first-generation model. The battery is specifically for a new 42-millimeter Watch, according to a post on China's Weibo. Current 42-millimeter models have a 246 milliamp-hour battery, which is typically enough to last a day as long as users don't engage in extended workouts or phone calls. Although the authenticity of the leaked part can't be confirmed, the "Apple Watch 2" has sometimes been rumored as getting a battery upgrade, solving one of the biggest user complaints. Competing smartwatches often need to be recharged every day or two as well —but some can last several days or more, such as ones from Garmin and Pebble. The new product is expected to launch later this year, and could be announced as soon as Apple's Sept. 7 iPhone event, though an October reveal is also a possibility. Frequently accurate KGI Securities analyst Ming-Chi Kuo has suggested that Apple will offer two different models, the higher-end one including extras like GPS and a barometer. In fact, a bigger battery might be needed in that device just to keep longevity the same, given how draining GPS tracking can be. Both new units will allegedly have new processors, as well as better waterproofing. At the moment, Apple recommends against taking Watches swimming or into the shower.